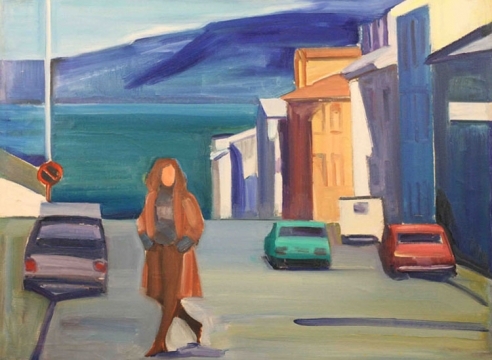 The Tibor de Nagy Gallery is pleased to present its fifth exhibition of works by the much-admired Icelandic painter Louisa Matthíasdóttir (1917-2000). The artist is best known for her luminous landscapes of Iceland populated with people, sheep and horses. The paintings are made up of simplified geometric shapes and highly saturated colors. The exhibition will comprise a selection of large and medium-sized paintings from the 1980s through the 1990s. The artist studied in Copenhagen and Paris. 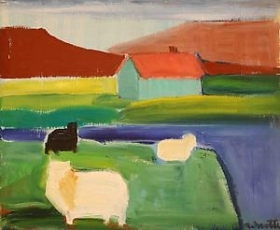 Her early paintings dating from the late 1930s established her as a leading figure in the Icelandic avant-garde community. In 1942 she moved to New York where she attended Hans Hofmann’s school. Along with a group of fellow former Hofmann students, including Robert de Niro, Sr., Larry Rivers, Nell Blaine, and Jane Freilicher, she helped to foster a new sense of relevance for representational painting, and a synthesis between the visual world and abstraction. 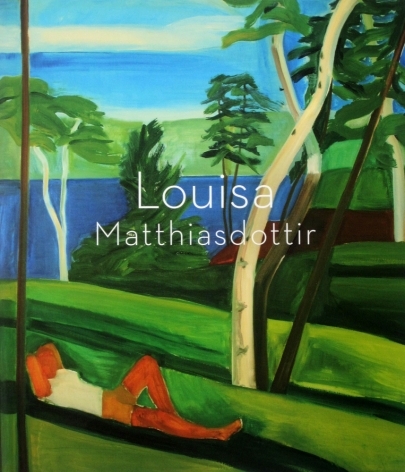 Louisa Matthíasdóttir’s work has been exhibited and collected widely throughout the United States and in Iceland. Her paintings are included in many private and public collections, including the Tate Gallery, London, the Art Institute of Chicago, and the Hirshhorn Museum and Sculpture Garden. A retrospective was presented at the Scandinavia House in New York in 2004 which than traveled to Iceland and Europe. The National Gallery of Iceland will present a Centenary exhibition of the artist’s work in the fall of 2017.